Official artwork of a Bronto Burt from Kirby: Triple Deluxe. Bronto Burts (ブロントバート, Bronto Burt) are enemies from the Kirby series. Two Bronto Burts, as seen in their debut appearance in Kirby's Dream Land. Bronto Burts are flying enemies very commonly found in the Kirby games, debuting in Kirby's Dream Land. Some of them fly constantly, while others stay perched on the ground and, when Kirby approaches, take flight and chase him. They never provide any Copy Ability when swallowed. Bronto Burts, along with King Dedede, make cameo appearances in the background of the Dream Land stage. Bronto Burt's cameo on Dream Land in Melee. Bronto Burts reprise their cameo on the Dream Land stage, which returned as a Past Stage. Bronto Burt appears as a trophy and a sticker in Brawl. Bronto Burt trophy in Brawl. A bird that looks a lot like Kirby. Bronto Burt has clear wings that he uses to busily flutter around the skies of Dream Land. He will pull off sudden dive bombs on occasion, and although he has no ill will toward Kirby, Bronto Burt will sometimes collide with the pink hero if he gets in the way. You should be especially careful of these collisions. Bronto Burts reprise their background role on Dream Land, which appears as downloadable content. A Bronto Burt in Smash Run. Bronto Burts appear as enemies in Smash Run in Super Smash Bros. for Nintendo 3DS. They fly around and attack by ramming into the player while spinning: this deals multiple hits with low knockback and 5% damage total. They are easy to defeat, and thus provide little in the way of stat boosts. Bronto Burts appear as part of the Kirby-themed Vs. Enemy Team final battle. The Bronto Burt trophy is exclusive to Super Smash Bros. for Nintendo 3DS. 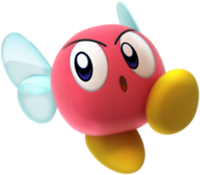 These pink, winged enemies are all over the place in the Kirby series. In Smash Run, there are three different types of Bronto Burt, including one that relentlessly chases after you. Their spinning attack might not deal much damage, but there's a danger you could get launched if it hits you repeatedly, so be careful! Bronto Burt appears as a Spirit for the game's Spirit mode. This page was last edited on March 1, 2019, at 22:59.